A beautiful lawn can add curb appeal to your home and provide a great space for your family to relax. Having your lawn professionally mowed can help your grass maintain its beauty and health. Professional lawn mowing services use different techniques to help make sure your lawn is taken care of correctly, without causing damage to individual blades of grass. Lawn mowing can help your grass regenerate faster and make sure that the grass that does grow remains healthy and strong, reducing the risk of diseases in your lawn. We make sure we use the best equipment to care for your lawn, which pieces of equipment we use will depend on the size of your yard. We can have your lawns taken care of quickly and carefully so that you can just sit back and enjoy life. A lawn mowing service can save you valuable time. There is no need to store a mower and other lawn care tools. Save on costly repairs to lawn equipment. If you have grass or plant allergies, a mowing service can help care for your lawn so that you don’t have to expose yourself to allergens. A lawn mowing service can help you care for other aspects by giving you advice on how to care for your lawn. We use mulching blades on all of our lawn mowers as we believe mulching as we mow can assist in the health of your lawn. Mulching your lawn can provide a natural fertilizer letting you use a lesser amount of other fertilizers. Mulching can help retain moisture, letting you water less. A good layer of mulch can help prevent the spread of weeds. Mulching can protect the ground from insects that cause damage to your lawn. 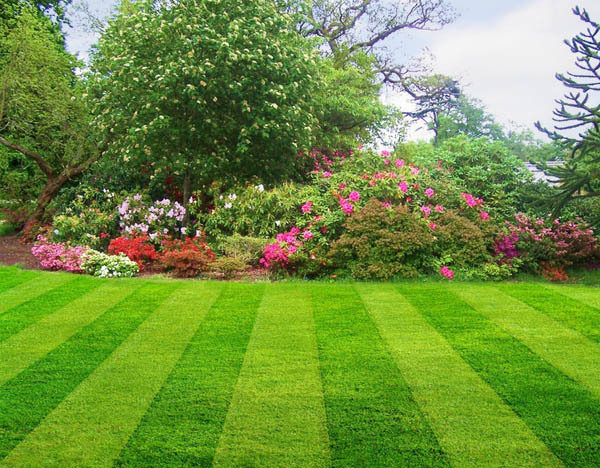 Our lawn mowing services can save you time and provide your lawn with the right care. Our equipment is designed to provide the best care possible to your lawn. Find out more about our lawn mowing services.